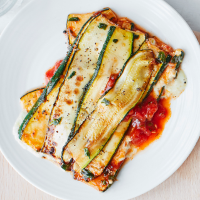 Leave out the goats’ cheese to make this gluten-free lasagne dairy free, too. 30 seconds. Tip in the tomatoes and honey; simmer for 15 minutes, until thickened. Season, stir in the oregano and set aside. 2. Meanwhile, in a separate small saucepan, heat another 1⁄2 tbsp oil and sauté the leek for 8 minutes, until soft. Tip in the beans and stock; simmer for 2-3 minutes, season and take off the heat. Blitz in a small food processor or NutriBullet with the goats’ cheese, then season and stir in the lemon zest and juice. 3. Heat your largest frying pan over a high heat. Toss the courgette with the remaining 1 tbsp oil, season and fry, in batches, for 2-3 minutes on each side, until softened. Place 3 strips of courgette on a plate, spoon over 1⁄4 of the tomato sauce, top with 1⁄4 of the cheese sauce, then repeat to build another layer. Repeat to create a second lasagne and serve, with a green salad, if liked.